The streaming marketplace is becoming increasingly segmented, with big new brands like iTunes Radio and Beats Music competing with Pandora, iHeartRadio, Spotify, Rdio and a multitude of others for listener’s ears. Many of the streaming services offer similar options – personalized song recommendations based on a listener’s likes and dislikes, playlist building, social features, etc.. Some offer on-demand song plays as well. Big data – the term used for collections of data that are so big that special processing is needed in order to use it – is a key component of these customized listening features. Services like Pandora, with 200 million registered users, collect information from listeners that includes their age, location, and gender. That basic information is useful for targeted ad campaigns. But there’s a lot more to big data than that – and that’s the stuff that music personalization is made of. Each time you like or dislike a song, skip an artist, type in an artist’s name, that’s more information that can be processed. Key to effective use of big data are services that specialize in processing that information. Companies like The Echo Nest (recently sold to Spotify) and Gracenote (owned by Tribune Company) work with many of the platforms, creating data sets that enable Pandora, Spotify and others to better understand their listeners. Big data processing is important on the advertising side as well. Companies like Pandora and iHeartRadio employ their own fleet of programmers to keep their data proprietary and make it understandable and useful. Third party providers like Triton Digital work with many companies to process their data and create identifiable audience characteristics. From selling tickets to the Carole King musical “Beautiful” on Broadway by targeting listeners who like her music, to selling flowers for Mother’s day to guys of a certain age who tune in to kid programming so their kids can listen, it’s exciting to think about the possibilities that big data can offer to streaming audio. By the end of this decade, 93% of new cars will offer streaming music as part of the built in entertainment system. That’s the prediction of new research out from ABI Research in the UK, which forecasts that global shipments of streaming music enabled automotive infotainment systems will top 66 million by the end of 2019. The study says that Digital and HD Radio formats will never scale to replace FM, and auto manufacturers will continue to include FM receivers in cars for many years. But listening to FM will gradually be replaced by streaming radio and music services as more and more cars become connected. 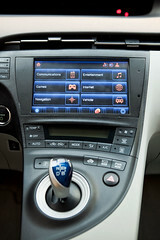 Car manufacturers know that in car entertainment systems are important to consumers, particularly younger ones. The race to integrate connected dashboard technology is on. As carmakers search for innovative platforms to call their own, fragmentation is high at this early stage. Streaming services like Pandora, iHeartradio and Spotify, looking for ubiquity, must integrate with each platform individually, an expensive challenge. The impact of connected dashboards on the future of radio is high. A connected driver can receive highly targeted messages based on what they are driving, and where they are located, offering greatly enhanced value to advertisers, and higher net cpms for the music services. We’ll be discussing all of the developments, challenges, and impacts that the connected dashboard presents for our industry, with George Lynch, VP Automotive Biz Dev at Pandora; Michael Bergman, Senior Director, CEA; Jake Sigal, Founder, Livio; and other smart folks at RAIN Summit West on Sunday April 6th in Las Vegas. Join us and become part of the amazing buzz surrounding our industry at our biggest event of the year. Early registration rates end soon. It’s press release week – err, I mean CES week – in our industry this week, a time when lots of folks gather in Vegas for the Consumer Electronics Show, and announce innovative products and projects. I don’t mean to belittle the announcements, some of which sound very promising. But it’s kind of a shame that it all has to be condensed into one week. In any event, two announcements in particular caught my attention yesterday. First, an announcement by AdsWizz and Aha by Harman, who have partnered to deliver ads. Aha has a strong foothold in the automotive market – in some 50 car models by 14 manufacturers. The AdsWizz piece enables audience targeting based not only on the usual age/gender demographics, but also including location, make and model of the car. Pandora‘s announcement yesterday concerned similar innovations – rolling out in-car audio advertising that enables advertisers to target listeners who are listening in their cars. Ford, BP, State Farm and Taco Bell are national brands that are targeting Pandora listeners in their cars. More than 4 million unique users have activated Pandora through a native integration in a car. Streaming audio services continue to refine their ability to deliver ads to consumers with precision, enhancing advertiser impressions by doing so. Increased targetability creates increased value for the advertiser by boosting an ad’s return on investment, and that’s a great place for our industry to focus innovative energy..
With more than 200 million registered users, Pandora’s collection of user data is substantial. Now they are beginning to use that data to create marketable audience segments that advertisers can use to target their campaigns. The first of these “proprietary audience segments” created by Pandora are Hispanic and Spanish speaking users of the service. To create these segments, Pandora cross referenced their registered users with zip codes that have a high population of Hispanic and Spanish speaking listeners, using publicly available census data. It’s still inference based targeting, meaning that the buyer has to agree to make assumptions about the consumer based on where they live, but it’s an improvement over cookie-based technology, which makes inference based assumptions as well – usually assuming that someone visiting a certain site matches a certain set of established criteria. Critics will argue that users often give false registration data as well, and that is certainly a factor, but probably not a significant deterrent for buyers who are looking for any improved ways of reaching more of the people they want to reach, fewer of those they don’t. Studies have shown that listeners are quite tolerant of targeted ads online, especially when they are targeted to offer products that the listener might find useful. In fact, Pandora’s capable of slicing up their audience by market, zip code, age or gender, or the kind of music they listen to, and has been doing that for a long time. These new customer segments are available in media buying software that makes it very simple for agencies to identify, price and purchase. It’s a smart way to market their large audience to advertisers and showcase their targeting capabilities. This video features Heidi Browning, Pandora SVP of strategic solutions, discussing the streaming service’s targeting capabilities. Innovative technology for connective cars continues, this week Pioneer Electronics debuted a new line-up of in-dash receivers that offer bluetooth and usb connectivity for Androids and iPhones. These affordable, aftermarket products make it even easier for consumers to connect and listen to streaming audio in their car, featuring Siri technology for voice commands, simplified Bluetooth connectivity for hands-free calling and audio streaming, enhanced playback compatibility, and Pandora internet radio. At prices starting at $90. That sounds like a pretty affordable price point to me. Pandora continues to lead the pack of services that come integrated into the new offerings, they recently announced that they are now integrated with more than 100 car models and 23 manufacturers. That doesn’t mean other services are unavailable – just that Pandora is front and center as the featured service in the car. Mazda recently integrated Pandora into its 2014 Mazda6, incorporating voice commands that make listening while driving very easy and fun. Pioneer Electronics Ted Cardenas and Pandora’s Director of Automotive Business Development Geoff Snyder will join a panel discussion at RAIN Summit Orlando on Dashboard Integration. Other panelists include Ford’s Global Lead, Business Development and Partner Management Scott Burnell, Slacker SVP Steve Cotter, and TuneIn VP Kevin Straley. RAIN Summit Orlando takes place Tuesday September 17 starting at noon and finishing with a cocktail reception in the evening. Register here, and use the code Audio4cast to save a few bucks. I hope to see you there! Pandora will be installed in one-third of the new cars sold this year, which represents an impressive effort on the part of the leading Internet radio station in the US. That fact appeared in wsj.com recently. Pandora’s strategy of gaining automotive deals also gets them lots of listeners – Pandora says they have seen more than 2.5 million unique activations through integrations from the 23 major automotive brands and eight aftermarket manufacturers they are installed with. Meanwhile, the popularity of streaming and the connected dashboard is not being overlooked by Sirius XM. Despite deals that already have their satellite service installed in a long list of vehicles, Sirius XM has been improving its streaming offering of late, and just announced a deal with Ford that will pair both its satellite and online radio offerings in new Ford cars with Sync AppLink. Smaller Internet radio stations that don’t have the brand power to create their own automotive deals have options as well. Harman’s Aha Radio and TuneIn are two aggregators that have deals with car manufacturers to offer access to a wide variety of content through their platforms, and Clear Channel’s iHeartRadio has announced deals with Toyota, GM and Chrysler. While market leaders like Pandora and Sirius XM make deals that put them front and center in your next new car, the truth is the dashboard of that car will probably have a unit installed that will enable you to access any content you want. At the Connected Car Conference during CE Week in New York recently, Audiovox President Tom Malone discussed the automotive aftermarket products his company is bringing to market, which are all about letting the consumer bring whatever content they want into the car. Solutions that enable the consumer to connect to their content wirelessly through a variety of options – smartphone, usb, cellular, and stored content in the car, for example – are the focus now. Connected car discussions are about more than just the dashboards these days too. Today’s consumers share listening less, and personalized content solutions are coming to the car as well, with rear seat docking solutions. I’ve been away on vacation for the past week and a half or so – a vacation where I barely got online and didn’t check my email at all. After the first few days, it was surprisingly easy to do, and very relaxing. It turns out, last week was a big news week for Internet radio, with Apple giving the first preview of it’s nicknamed iradio product, and Pandora purchasing an FM station in Rapid City, South Dakota. I spent my first day back reading a lot and trying to get some perspective on both announcements. iTunes Radio, it appears, will simply be Apple’s entry into the space, long awaited. After reading about it and talking to a few developers who have seen the interface, I guess it’s an Apple-esque, graphically interesting web radio interface that does the same things that Pandora does. Not a lot of innovation, but a well done product – possibly less than I would have expected from Apple, since I’m aware they have been actively working on this entry into the markeplace for at least a year and a half, when they contacted me. Don’t get me wrong, I think there will be innovation with this product, and I’m hopeful that it will expand the marketplace for everyone. According to one thing that I read, Apple is planning to sell ads on its streaming radio platform using iAd, its mobile ad business. Consider that Apple knows about its users, which provides for effective targeting, and has a credit card on file for each one of them, which most of them are accustomed to using already to purchase songs and apps. That’s a system that could translate to expansive online revenues for lots of advertisers. I don’t think Apple will mean a lot of trouble for Pandora, although certainly they will begin to share audience. Pandora’s got a large user base and a lot of happy customers. They may lose some share, but the number of people using Internet radio will continue to grow, and they’ll still gain listeners. Meanwhile, they’ll benefit from another major player in the marketplace who will help build advertiser investment. Look at it this way: it would appear that Apple’s game is to solve the conundrum of how to monetize the mobile audience, in particular the streaming audio mobile audience. I’d say that’s good news for the industry. Jacobs Media has updated its annual Tech Survey, which is a study of the media habits of core radio users. It’s a study that has 9 years under its belt now, so it’s a great chance to take a look at trends. In the big picture of how media stack up in terms of usage, there’s been a pretty big shift, with people using AM/FM an hour or more a day dropping below 90% into fourth place behind TV since the release of last year’s results. AM/FM fell 3% in a year, which is a shift that is hard to ignore. Meanwhile, usage of Internet radio weekly or more jumped 7% year to year to 45%. Last year’s survey results assigned 18% of Internet radio’s 38% to Pandora, but this year’s results don’t offer specifics on Pandora’s share. One of the salient takeaways from this study is that listeners are connecting with radio across a more diverse set of technologies. Jacobs Media President Fred Jacobs says it’s about “radio’s ability to uniquely connect with consumers on their preferred platform.” This survey of radio users is telling us loud and clear that they want to be able to access content across a diverse offering of media and devices. Last week Pandora announced a significant milestone when they reached 200 million registered listeners. The fact that the number of registered listeners leapt from 100 million to 200 million in two years makes it still more impressive. Remember, Pandora’s user base is largely in the US, although they have recently expanded to a few other places such as Australia. During a presentation last week at RAIN Summit West in Las Vegas, hundreds in the audience got a first look at updated trends in Infinite Dial 2013. Arbitron SVP Bill Rose and Edison Research President Larry Rosin offered some stats on Pandora, which has an impressive brand awareness recognition rate of 69% among adults 12+ in the US, a number that grew 10% since last year’s study. iHeartradio showed impressive brand awareness in the new study as well, with 45% brand recognition, a jump of almost 15% since last year. The study also reported that close to half of the folks surveyed had downloaded the Pandora app onto their cellphone. This fact reveals the steam engine driving both the growth in audience and brand awareness for industry leader Pandora – their amazing success with mobile apps. As usage of smartphones and tablets has soared, Pandora’s been right out there in front, gaining front page status on those devices. 21% of cell phone owners now saying they have used their phone to listen to a stream in their car, yet another indication of the growing importance of mobile devices. We’ll be discussing mobile devices, connected cars and a lot more again on May 23 in Brussels at RAIN Summit Europe. Have you registered? Hope to see you there!